I just recently took CSS-Tricks “HTTPS everywhere”. That is, every URL on this site enforces the HTTPS (SSL) protocol. Non-secure HTTP requests get redirected to HTTPS. Here’s some notes on that journey. General security. When you enforce HTTPS, you’re guaranteeing no information passed between the server and client can be intercepted and stolen or messed with in any way. That’s great for a site like this that has a login system and accepts credit cards in some places and things like that. The site as it is intended. I’ve heard of examples like hotel WiFi system and even ISPs that mess with HTTP traffic and do things like insert their own advertising code. Can’t do that over HTTPS. SEO. Google says you’ll rank higher. Horse’s mouth. Prereq. I can’t seem to find any good links on this, but I’m under the assumption that HTTPS is required for some/all of the stuff for SPDY / HTTP/2 – which everyone agrees is awesome and super fast. I want to make sure I’m ready so I can start moving forward on that. Not optional. This is how it works. I’ve done this a bunch of times in my life and it’s never overly comfortable. You just need to follow instructions closely. I’ve bought them in the past from discount providers and actually had it work fine, but it’s a more manual process. CSS-Tricks is happily on Media Temple, and they provide SSL as a service, and I’m more than happy to pay for that to have it installed painlessly by professionals. When the SSL certificate is installed properly, you should be able to visit your site (any URL) at eitherHTTP or HTTPS and have it come up fine. There may be errors on HTTPS though, and we’ll get to that. Make sure you test that HTTPS is working properly first! Go to https://yoursite.com/wp-admin/ to check. Otherwise you’ll be forcing URLs that don’t work and that’s bad. If you have trouble, remove that line right away. The next step is to get your front end on HTTPS. Forcing it all right away is probably going to be tough, so just start with one target page. For me, it was the signup page for The Lodge. That page can take credit cards, so really, it had to be HTTPS. This was the motivator for me early on to get this set up. There is a plugin that can help with this: WordPress HTTPS (SSL). 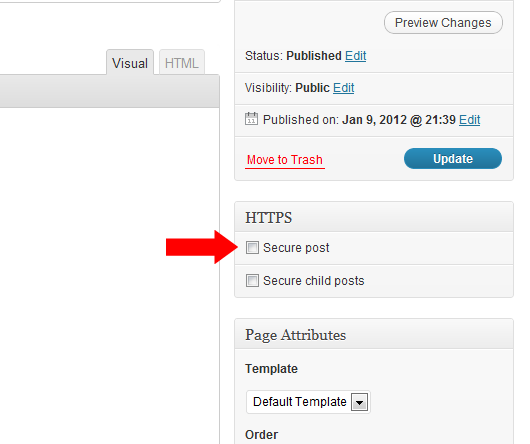 With that plugin, you get a checkbox on Posts/Pages to force it to be SSL. In this case, it was some images being used in a CodePen embed with an HTTP src. But it could be anything. HTTP <script>s, HTTP CSS <link>s, HTTP <iframe>s. Anything that ends up making an HTTP request that isn’t HTTPS will trigger the error. You just need to fix them. All. There are thousands and thousands of pages on this site, and lots and lots of images within those pages. Right in the content itself. There are a bunch on this very page you’re looking at. The problem is those images had fully qualified HTTP links on them. I didn’t relish the idea of using some WordPress filter on content to kinda hotswap those URL’s out – I just wanted to fix the issue. I hired Jason Witt to help me with this. The first thing we did was run some SQL on the database to fix the URL’s. Essentially fixing the src of images to be protocol relative. If you have a CDN set up (I use MaxCDN through W3 Total Cache) that means the CDN is totally different server and URL and all that and it needs to be able to serve over HTTPS as well. Fortunately MaxCDN handles it. Once that is in place, you can turn off the plugin and remove the bit from the wp-config.php file, as those are redundant now. Inevitably after going HTTPS everywhere, you’ll find pages with mixed content warnings. You just need to keep investigating and fixing.